Dinner in Nice from Bev Sykes on Vimeo. Well, I had my chocolate croissant this morning and determined that it just wasn't right without the Mediterranean in front of it. Kind of like a hot dog never tastes the same unless there's a ball game in front of it, cotton candy is only good at a fair or circus and popcorn never tastes the same in front of the DVR as it does in a movie house. I also cooked the trofiette we bought in Margherita Ligure with home made pesto and it was OK, but it needed Portofino to taste right. The prosciutto and melon wasn't nearly as good with the thinner, dryer American prosciutto and the thrill was gone. I also finished editing all the vacation journal entries, updating them with additional information and adding lots of photos. I'm slowly posting videos, not so much "videos," but more snippets of moments in the trip probaby more interesting to me than anybody else. I guess I really have to admit it: after a year of planning, my vacation is over and I need to do something else. It's time to realize that I'm home again and find something "normal" to do. Actually, we DID do something "normal." I've reviewed two shows this week. "Thoroughly Modern Millie" at Music Circus was difficult because I didn't realize I was on the verge of getting sick and it was so hard to stay awake. Fun, silly show, but Walt had a full time job poking me to keep me awake. I came home, wrote the review and went to sleep for the next three days. "Picked" was a modern day adaptation of the standard fairy tale at the little Barnyard Theatre on the outskirts of town. It's a group that puts on one show a year, when its members are home on vacation from their college curricula. When it started, the founder (and director of this year's show) had just left high school; he's now in Yale's graduate program for technical theatre. I'm wondering what will happen to Barnyard Theatre as the original founders (who still perform) start their adult lives. Ellen (of Ellen and Shelly) was at the show and we talked about vacations in general and she made the profound statement that it's always strange to come home after a 2 week vacation and realize that while you feel this profound sense of having Been Somewhere and Done Something, people at home have just gone about their daily lives and it doesn't seem nearly as momentous a thing to them as it does to you. I felt that way myself when I was driving around town buying groceries. I realized that if it had been Walt who had been gone, the two weeks would have flown and I probably would hardly have noticed the time. But for me, the two weeks seems like a huge amount of time because it was so packed with adventures. But life moves on today. Tom, Laurel and Bri are passing through town and we are going to get together with them at Ned & Marta's house. I have silly little mementos for everybody and this will give me the opportunity to get most of them off of the dining room table in one fell swoop. It will also be fun to see Bri again, since I don't think I have seen her since her birthday in March. Walt has been to Santa Barbara a few times and so has seen her more recently. And there are things coming up in the coming week -- two more shows to review, a meeting with my mother, her lawyer and her stepson on Wednesday (going over the provisions of her trust, in these sadly changed financial times), and on Sunday we hold the 23 G.R.U.B. dinner, remembering my friend Gilbert's life. France and Italy are fading into the background now, almost like a dream. But it does leave me with a sense of worldliness. I watched an old Jean Seaberg movie, set in Paris, last night and in it her lover wants to take her away for a quiet weekend of romance in St. Paul de Vence. In the next scene the two are lying on a boat, floating along calmly. 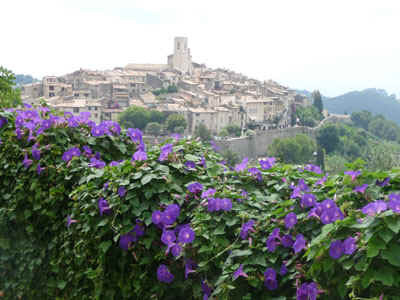 I've now been to St. Paul de Vence and know that it is a hilltop village not very near the ocean! It bothered me the whole movie, as did the very Malibu looking beach house supposedly on the Riviera in the movie that followed it. So since it is now nearly 2 a.m. and I've been awake for an hour (never go to bed at 9:30, even if you can't keep your eyes opened! ), I'm now uploading photos yet again and will pick them up on the way home from Ned's. Then I think I can finally put this trip to bed.